Anyway, this painting is on a paper called Yupo. Yupo is a totally synthetic paper, basically it is a plastic. I think it was originally used in the printing industry. 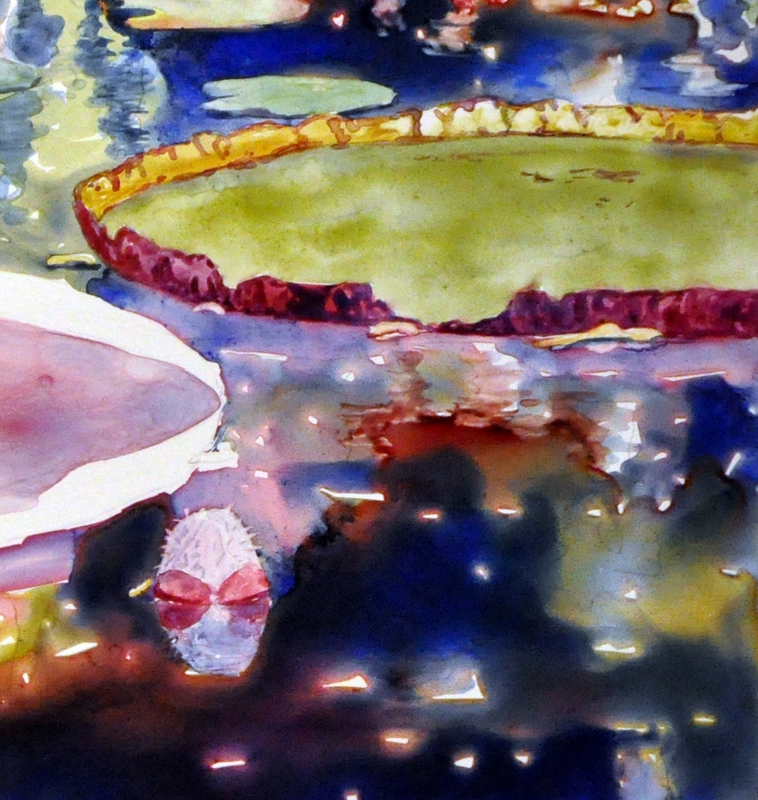 Probably about 5 to 6 years ago some watercolor artists started experimenting and painting with watercolor on Yupo. You might think that being plastic, the Yupo would not work with watercolor, but there is just enough of a matte surface to the Yupo that allows the paint to adhere. 1. The paint doesn't sink into the paper at all, it sits on the surface of the paper and therefor looses none of its brilliance! 2. I am a very detailed, realistic painter, and I have to be more direct on Yupo. What I mean by this is, that it is not as easy to layer on Yupo so it works better to put down the value of the passage the first time. 3. If I don't like what I am working on I can literally put it under the faucet and wash it all off. Except for some of the staining colors, you can get the surface back to the pure white and start again. 4. Normally, I stretch my paper because I use 140lb. Arches cold press paper and this keeps it from buckling while I am painting. Yupo does not need to be stretched. All weights of Yupo will not buckle when wet. Here are two close ups of my painting in process. As you can see, the background water is very loose and wet-n-wet looking. In fact with Yupo, even when dry the paint can look wet. 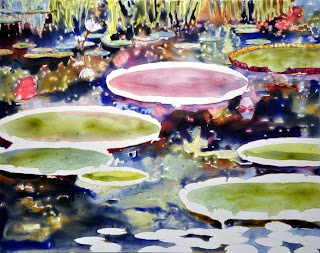 I have also started to add detail and more realistic areas by starting to paint in the waterlilies and waterlily pads. When I am painting more realistically, I use less water and more paint. Because the paint does not sink into the paper, it is very easy to lift. Sometimes that is a benefit and other times it is a curse. If you are looking for a new surface to try, Yupo is a lot of fun once you get used to how you need to work on it. 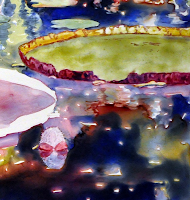 NOTE: when you are done with your watercolor painting on Yupo, it needs to be sealed with an archival, acrylic sealer of about 4 coats so that there is no chance of water or moisture in the air ruining your piece. If you have questions about working with Yupo please let me know. * My painting of the fuschia pink zinnia "Zesty Zinnia" in the slide show to the right is also on Yupo. Thanks for sharing this...it's looking pretty good already. I've tried Yupo in a workshop situation only once...everything you are saying is so correct...thinking of trying it again. You should try Yupo again. 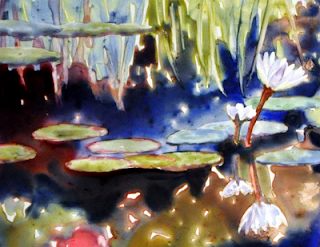 Congrats on your Honorable Mention from the Colorado Watercolor Society show! Thanks for the response and the congrats. Would you believe that the painting also sold! Both were quite unexpected. I'm a bit nervous about Watermedia...lots of competition...highest response ever. I'm sure you entered, so I wish us both luck. Hi Lori - Along with my stack of demo paintings that I too need to finish is some Yupo paper that I have yet to try - thanks for the inspiration!